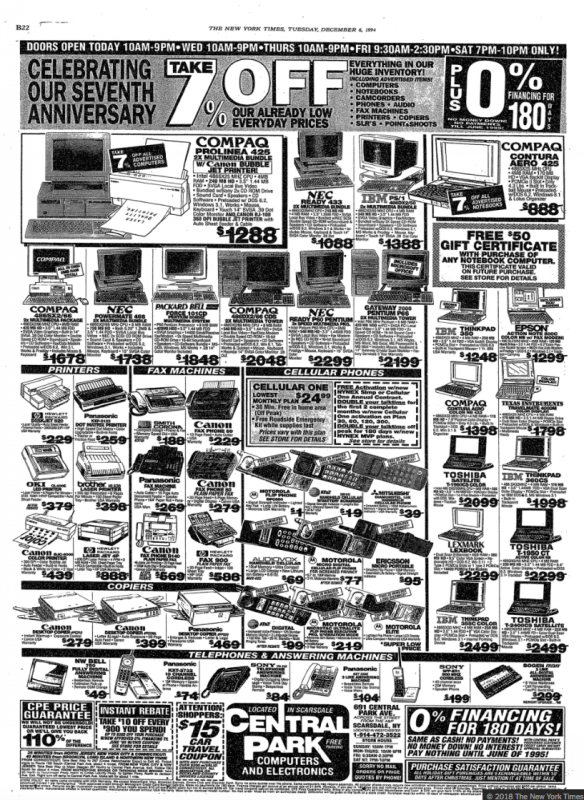 I love seeing old computer ads, it's fun to revisit what was available at what time. Thanks for sharing! I graduated college in 1995 and bought a Pentium 1, it was great. I want to say it was around $1200 but I could be mis-remembering. I totally splurged on a 17" monitor as well, I used that for 10+ years. 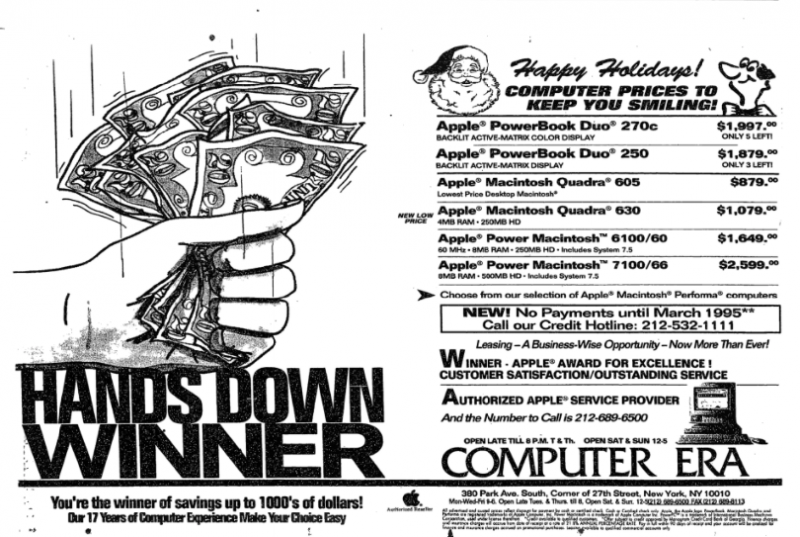 Since I was doing some 68000 programming at the time I considered buying a low-end 68k-based Mac but IIRC they had just transitioned to PowerPC machines so it didn't seem like it'd be worth it long-term. Games were a big factor, of course. Good times. Edited by BydoEmpire, Thu Jul 19, 2018 2:40 PM. Wow. Memories. 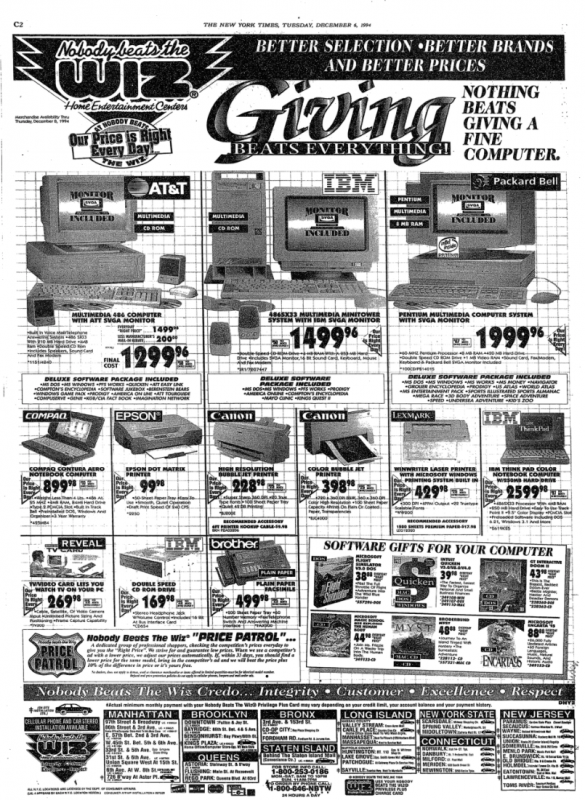 I was selling computers at Sears during this time. 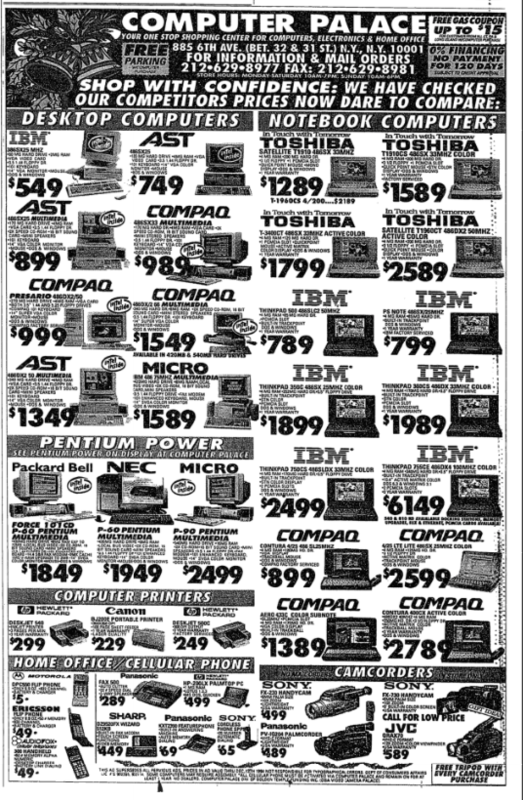 I remember the transition from 486 to Pentium and then trying to explain to the customer why a Pentium was better (and more expensive) than a 486. I think Compaq at the time dabbled with Cyrix processors for a short while. I put a Pentium demo that I got from Intel at a trade show onto all the display PC/Compatibles. It worked on all (Packard Bell, IBM) but not the Compaq. Found its processor was different. This was shortly after I got my first PC clone, which was a Packard Bell 486 similar to the one at the top of the CompUSA ad, but mine was a 486SX/25 when I got it. I'm not sure if I'd upgraded it by then or not, but I did pretty constantly upgrade it after I bought it so it may have been a DX/33 or a DX2/66 by 1994. 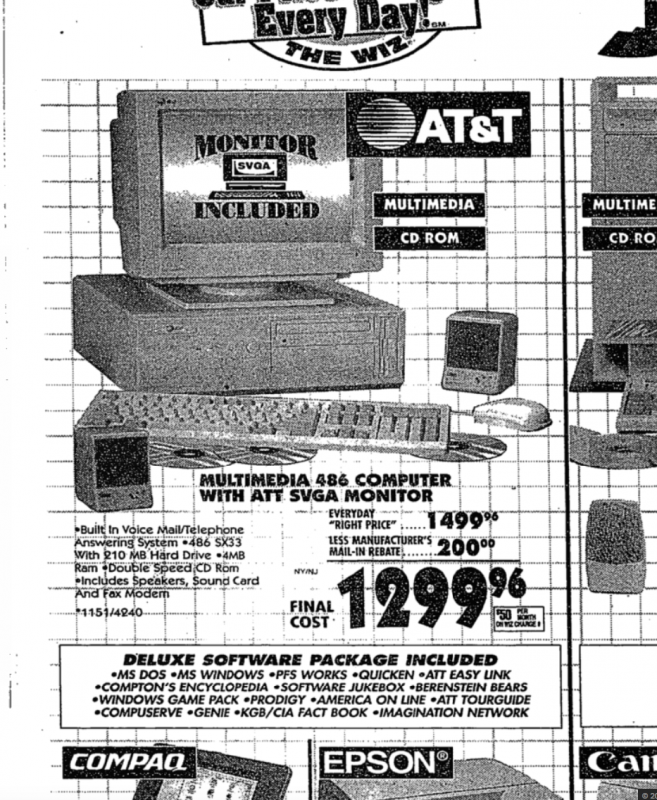 IIRC, my system was $1,499 with a monitor. It was in NO WAY worth that price. What a piece of crap. But it could play Doom perfectly, so there's that. It was buttery smooth. I do remember a roommate of mine in college in 1993 still had a 386, and he had just gotten it. So they were still around. I was actually kind of jealous of his computer because for one thing, his 386DX/50 or whatever it was was not really any slower than my 486SX/25. I'm sure you can find benchmarks these days that show that. And his was a Gateway 2000, which at that time made *awesome* computers. I remember thinking they were the best around; even better than a real IBM at that time. His computer just felt like a real computer, while my Packard Bell just felt like a toy. 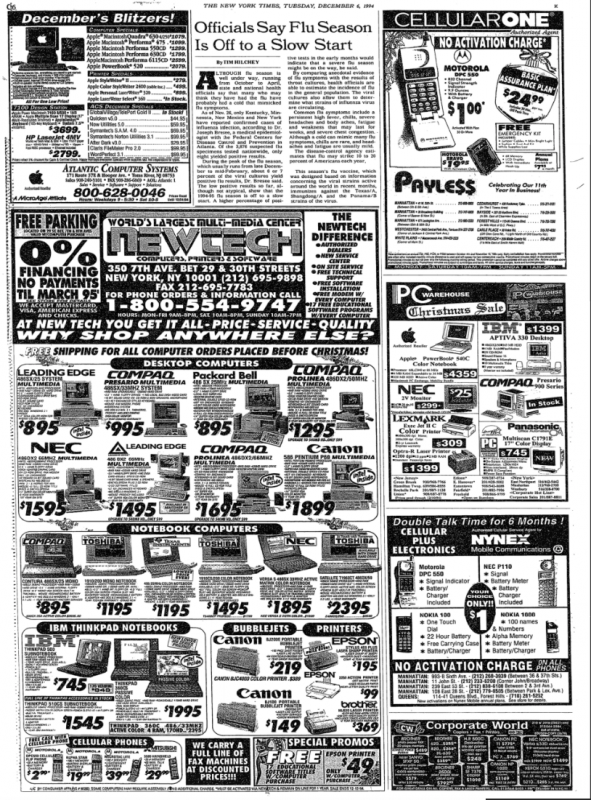 I think the reason I went with the Packard Bell is that my dad was buying and I was worried he'd balk at anything more expensive; my PB was the cheapest computer in the store with a CD-ROM drive, and that was a new feature in 1993 that I knew I had to have. I think it's funny that Acer bought up both Gateway and Packard Bell. I suppose I like them, since I have a plurality of low-end PC tech from them. I'm unwilling to settle for anything less than Apple tech for mobile devices, willing to drop close to a grand on an iPhone, but for PC stuff, Acer's midrange seems to suit me just fine. Acer started out in the US as a similar company to Gateway; I think they mainly were a mail order company, and I remember them not being bad at that time. Another old roommate went from an Atari ST to an Acer, and I used his PC a lot too. I remember it being a little more generic than the Gateway 2000 that my college roommate had (in that I don't remember much specific about it), but I do remember thinking they were one of the better brands at the time, and my roommate for some reason refused to even buy anything else. So it probably makes some sense that they'd buy Gateway 2000 after Gateway fell on hard times. And the last time I heard anything about Gateway, their computers had really gone to crap. I just looked them up now and was surprised to see that they still have a web site! It looks like it was designed in like 2006, though, and even though they show their last computer lines, they don't seem to have any actual models listed. I was always a little sorry for what happened to Gateway; they were so good for a while. Even just the materials their early computers were made from were a step above everybody else. I remember my roommate even had one of those full keyboard membrane covers on his keyboard to protect it, because it was worth protecting. My keyboard, by contrast, was thrown in the garbage about a year after I got it. I'm not sure they're the same company. There was an Acer Labs that made PC tech back then, but I think it's a different outfit. Acer the computer company has always been Taiwanese. Did your friend's computer have this logo? Ah $6K is cheap for high end IBM ThinkPad. A fully maxed out memory, maxed out dual SCSI drive ThinkPad 860 cost about $20,000 back in the day (~'95). IBM only sold a very small number of these and most were sent to the crusher for the tax right off...I am not kidding. The Thinkpad 8XX were actually PowerPC based multimedia laptops. IBM had a grand plan back then to beat out Intel with the new PPC processor designs (603/604) and make PPC with OS/2 the new next generation multimedia personal computer standard. This included running most modern OSes at the time (AIX. Windows, OS/2, MacOS and Solaris). In the IBM labs we had lots of different OSes running on Thinkpad 8XX: Windows 3.51 PPC, Windows NT 4.0 PPC, OS/2 PPC version with Harmony/MIT Microkernel, AIX 4.1, AIX 4.2, Solaris 2.5.1 PPC, Copeland (Beta) and a bit later a custom hacked PPC Linux based off Red Hat. Note though only AIX was officially supported. I have one of the original prototypes from 93/94 and it is stamped with Thinkpad 800. The prottype is based on a 602 processor (also used in 3DO developed M2 game console) which is an embedded PPC multimedia processor but it runs AIX 4.1 and Windows NT 3.51. That prototype model was never released but was created to design/test/debug all the OS device drivers for all the planned hardware releases. You can find some details on the web. Below are some guys with OS2 PPC and Windows 4.0 on their Thinkpad 8XX. Edited by thetick1, Fri Jul 20, 2018 4:26 PM. Yeah, I meant when they started in the US. They were Taiwanese, but they entered the US market around 1987 or so, and as far as I know were mail order only for a while after. They were still a small company in those days, in both territories. I think they've only been around at all since the late 70's. Edited by spacecadet, Fri Jul 20, 2018 4:24 PM. Ah, 1994...the year I took 3 buses in San Francisco to get a (mono) Sound Blaster 2.0 card. Found the "shop" operating out of a tiny public storage unit in an alley, paid cash, and made it back alive. Thus began my addiction to Sam & Max Hit the Road, Microsoft Arcade, CANYON.MID and Dr. Sbaitso. Meanwhile, my roommate had a $4000 Packard Bell P90 with all the bells and whistles, courtesy of his rich lawyer dad. And no, he wasn't a total snot nose. Real nice guy, surprisingly. Anyway, thanks for posting these, they're fun to browse. What kind of "486" is that in the second ad, upper left corner? Can't quite make it out, a 486 SLC or something? This was around the time I built my first PC, I was young and broke and basically bought parts as I could afford them and assembled them. Not sure if I spent more or less than this in the long run. What kind of "486" is that in the second ad, upper left corner? Can't quite make it out, a 486 SLC or something? Here's a clean closeup, does this answer your question? It's the typical "family bundle of low-end stuff" beige box deal. "Nobody Beats The Wiz" was kind of like a local version of Circuit City. There were also small computer stores that customize your PC as you need it. They cost a bit more but you know they're way better build than the Crappard Bells back then. Are there any of those stores still around? Yes, thank you! At first glance it looked like "486 IC3" or something, so I guessed maybe it was one of those obscure Cyrix/IBM chips. Gotta love those "family" PC's. Often it was just a euphemism for a 486-50 or 66 with no external cache and/or ISA video cards, with a bunch of cheap bundled software to make up for it. Shame, shame! I dunno, use your google machine. :-) Probably not -- or not recognizable as the same kind of place. Big stores CompUSA and Wiz are long gone. The Wiz lives on forever on a Seinfeld episode: Nobody beats the Wiz! Edited by thetick1, Tue Jul 24, 2018 6:04 PM. Heh that's funny, and very NYC. I love this NYT headline about his death, "retailer and felon"
Hah... love the CompUSA ads. 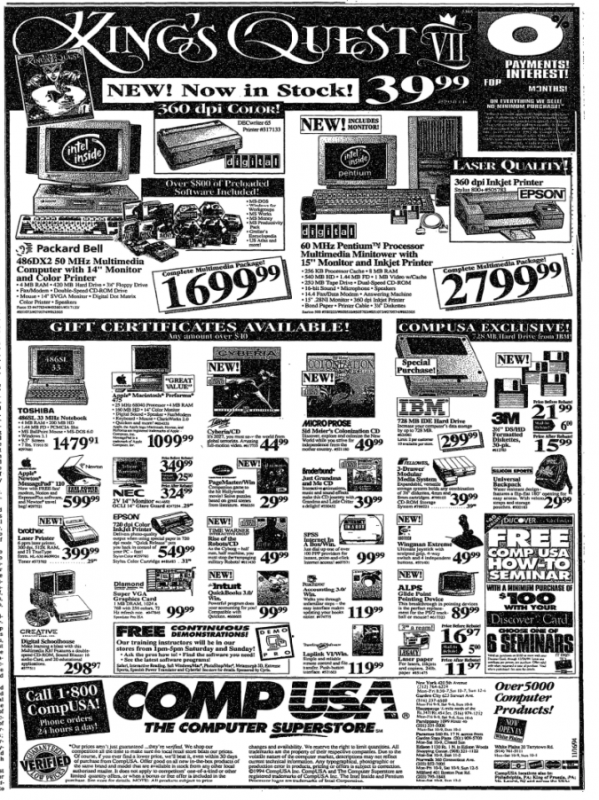 I used to work for CompUSA back in the day. I may still have my red CompUSA shirt somewhere also. The COMP USA near me was replaced with a Micro Center, which I love. When boxed software was the only game in town, I loved CUSA, despite their shady rebate practices. Yea Micro Center is about the only brick and mortar computer retailer still in business. I still go to one near me usually to physical handle what I'm looking to buy. More often than not I just buy there instead of order online as I would like to support keeping them in business. Anyway the CUSA by me was converted to CVS drug store quite a long time ago. CVS sells useful electronic things like charging charging cables, flash drives, blank media -- more than can be said for a toy store like GameStop. Remember when they sold productivity software at GameStop's ancestors like Babbage's? When I lived in Chicago my team and I would sometimes use our lunch break to go to MicroCenter and check out the games and other stuff. At that time (late 90s, early 00s) they started to stock discount "older" software - I picked up a lot of games like Perfect General, Fallout, etc for only a few bucks new. 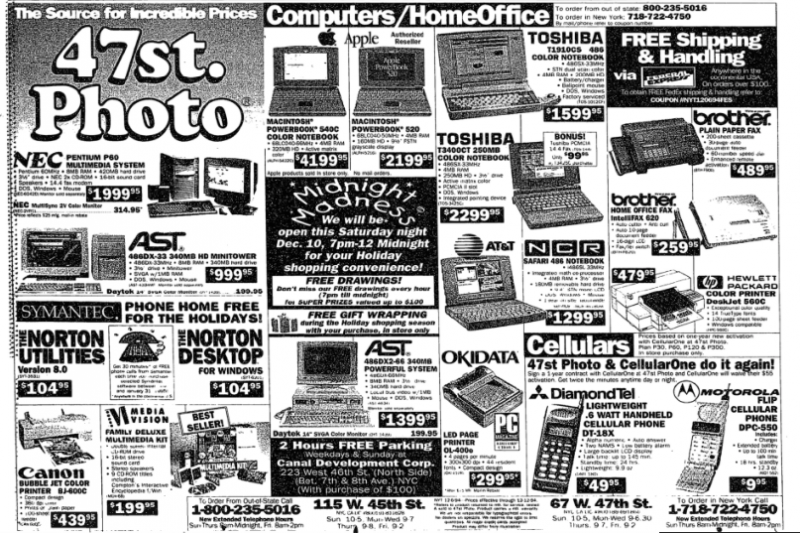 I bought a lot of stuff at MicroCenter around that time.